I love KnowedgeQuest and their products. I have most of them and have been very happy with all of them. I love their "What Really Happened" biography books, and their book on Canada, and their 50 States book, and most of all, I love their MapTrek book. My girls and I enjoy their Timeline Builder app (my review is here), and I'm looking forward to using their Medieval Life app as we study that time period this year. I have enjoyed using the previous two volumes of A Child's Geography by Ann Voskamp, and when I heard about Volume 3 coming out, I pre-ordered it. I was so happy when it arrived! I immediately took the lovely large map that came with the book to be laminated and printed out the papers I thought we might want for my binder. Terri Johnson of Knowledge Quest is the author of this newest volume. She's a homeschooling mother of 6 with a passion for geography. The books in this series are aimed at children in grades 1-6, but I used this book with my middle schoolers, and they enjoyed it. There is plenty here for older children. docuement includes websites, biographies, picture books, fiction books, cook books, and websites. The book is written to sound like you're walking through the countries of the classical world with a guide. 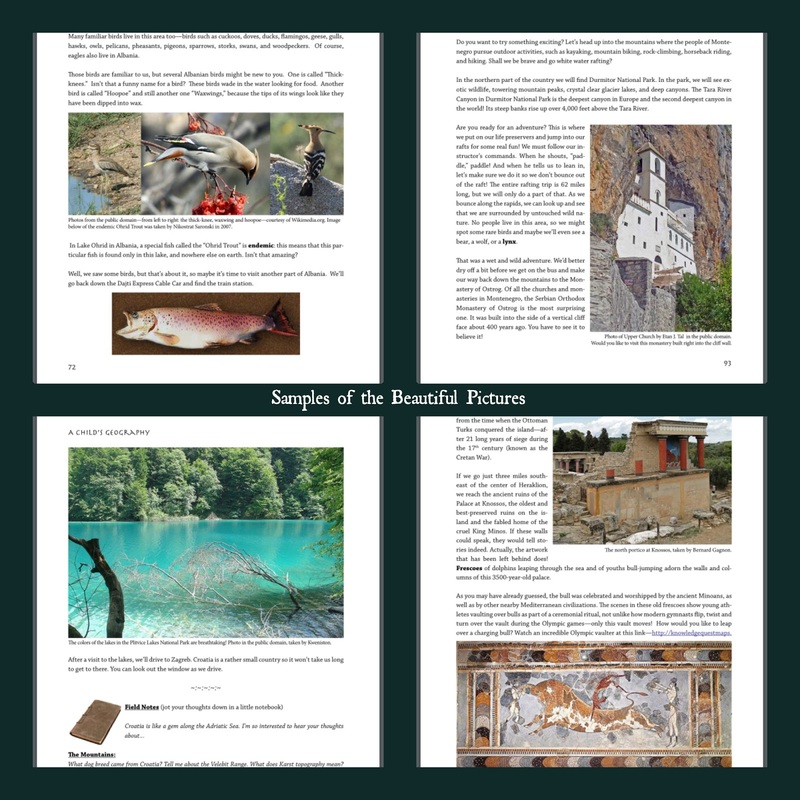 It's written narratively, with beautiful pictures of the countryside, along with ancient artifacts and ruins, pictures of life as it is there today, and wildlife you might encounter. The photography in the book is simply stunning. If you can't be there yourself, the pictures are surely the next best thing! Each chapter is broken into at least two parts, and sometimes more, which keeps the readings short and manageable. At the end of each section, there is a "Field Notes" heading, which encourages you to write your thoughts in a "field journal." This is when you have your children narrate back what you've read, and there are questions to ask to be sure they got the pertinent information, as well as a list of events you can add to a timeline. In the back is a glossary, with the definitions of the vocabulary words you find in bold print throughout the text. My girls and I sat at our table. I read to them, and they narrated to me. 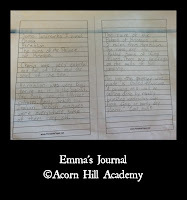 Then, I had them write their narrations in their field journals. 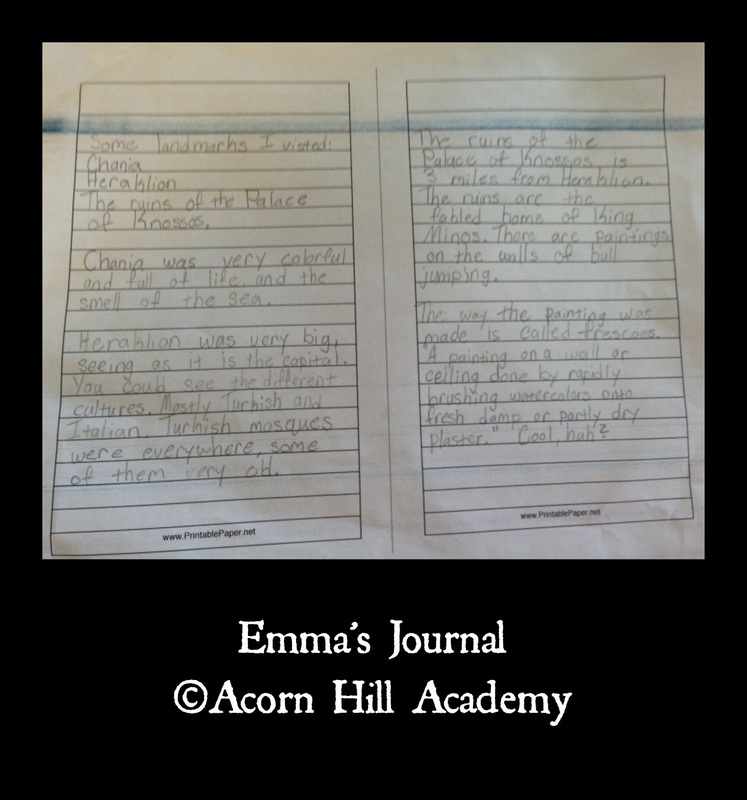 I found printable journal paper in half-sheet size, so we could fold it in half and put it in the little binders we used for our travel postcards from the first book in this series. I thought the smaller notebooks made it seem as though we had real field journals. As we worked our way through the first chapters of this book, I had one child inform me she thinks narration is "boring." I was, to say the least, astonished. This child has done narration since the beginning of her education, and she thinks it's *boring? * Come to find out she simply didn't like doing the same thing repeatedly, so I encouraged her to come up with different ways of keeping her field journal. She could draw a map, or a picture of an animal from a particular region, or whatever she felt would make her field journal something valuable to her. We studied ancient Greece and Rome over the last school year, so this book fit right in with what we learned. It was a nice way to spend a few weeks over the summer, looking at pictures of the places we've studied and seeing what life is like there today, as well as learning more about the history and topography of the region. Asa we continue, I plan to use lots of the included recipes. Both my girls like to cook and will enjoy honing their skills on some fun new things. I love having a hard copy of the book to hold, and look at the pictures. I find more and more often, though, that having a digital copy is helpful, too. I am not always the most organized person (ahem) and while I can always find my iPad, books have been known to wander away after school time, and we're stuck looking for them when we need them next. It's handy to be able to pull up the digital edition so we can continue with our studies and look for the book again when school is done for the day. Also, if we want to take school outside, I'd much rather take my iPad than haul books. Intrigued, but want to know more? You can download a PDF file of the first three chapters of A Child's Geography: Explore the Classical World here. 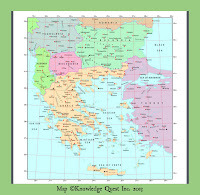 This book is available from Knowledge Quest for $24.95 for the ebook, and $39.95 for the paperback book (which also comes with a 22"x34" wall map, a $9.95 value included FREE). 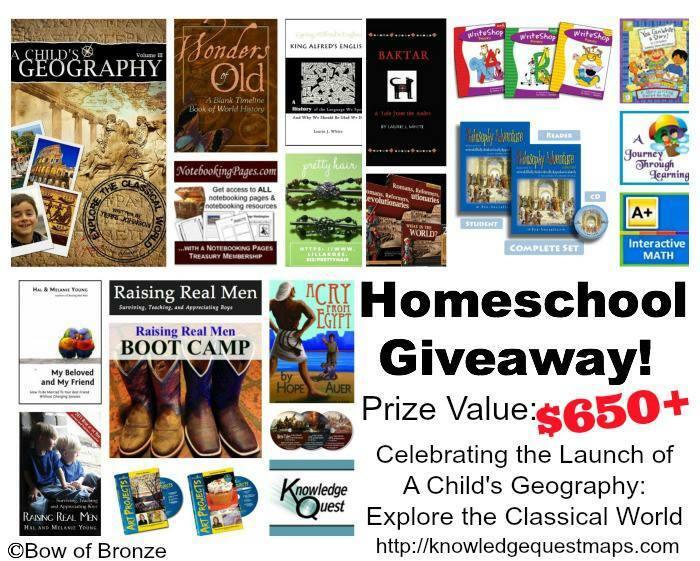 GREAT NEWS: I am authorized to give away one free copy of A Child's Geography Vol. 3 to a lucky winner! Enter through Rafflecopter below. The giveaway ends September 14 at midnight EST. THAT'S NOT ALL! Knowledge Quest and many sponsors have come together to offer an excellent giveaway package worth more than $650. This giveaway also ends September 14 at midnight EST. Check out these awesome prizes and make sure you enter! Disclaimer: I received a free digital copy of this product in exchange for my honest review. I was not required to write a positive review nor was I compensated in any other way. All opinions I have expressed are my own or those of my family. I am disclosing this in accordance with FTC Regulations. How secular or religious is this volume? 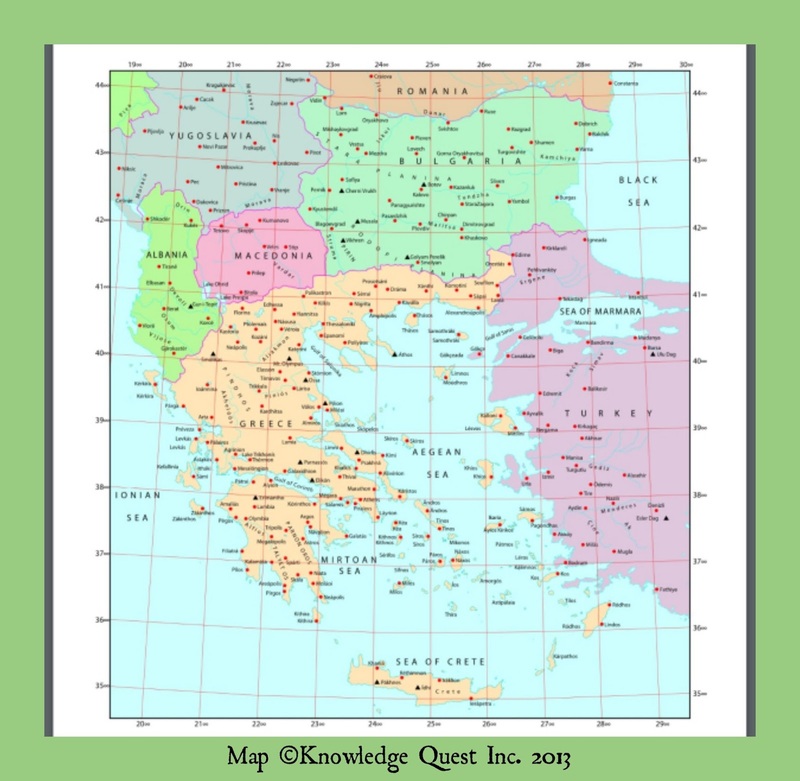 Map Trek is my most used Geography resource. We're loving Trail Guide to US Geography this year, though! Hi, Bear! :-) When reading the text, I don't find it to be overtly Christian. For example, in Ch. 1, it's mentioned that ancient Minoans worshipped the bull, but there is no judgement passed. Similarly, when Mother Teresa is mentioned in the chapter on Albania, it states that she was a missionary and an amazing, selfless woman, but no further discussion of her religion. The prayer guide comes on the CD as a supplemental document, and is the only thing I see that could be construed as overtly religious. I really like Children Just Like Me for geography. I haven't used a lot of curriculum specifically for geography, but we've always had either a world map or a map of the USA hanging at eye level in the hallway of our house and I send my kids there when we need to find out where some city, country, river, lake, etc. is. We just started homeschooling this year, but I'm a lover of maps and that has appeared to rub off on my son! I do not have a favorite geography resource yet. My children are just getting to an age where I can begin teaching them. I am so excited! I have not used a lot of geography curriculum. My children are just now getting old enough to teach, so I am excited. I haven't used a lot of geography curriculum as of yet. I am still looking around. What we do use right now, is an atlas of the United States. I like Beautiful Feet, but I've been wanting to try Knowledge Quest for a long time!